What If You Offend Someone? The following is a guest post written by a good friend of the stuttering community. Hiten Viyas, from England, writes regularly from his blog, the Stuttering Hub. Hiten also offers his services as a Mentor/Coach for people who stutter. I am pleased to have Hiten as a guest writer today, sharing how we can turn negative thoughts about stuttering into a more positive perspective. Dealing with the emotional aspects of stammering can be tough. Sometimes you can be so ‘into’ an emotion, it feels like no way out. Below are 5 common beliefs about stammering you may find yourself in, along with different ways of looking at each one. Society has falsely led people to believe they need to be as good as others. It’s a comparison thing. But is the world really like this? I’m 5’7 in height and am from England. You might be 5’9 in height and from the United States. Is there any point in us trying to compare our heights when one of is already taller than the other? One person might speak fast. Another might speak a bit slower. Where’s the sameness in this? There isn’t any. It’s all different. It makes no sense to compare yourself to others and wanting to be the same as others, because everything is already so different. How does this work? I don’t think stammering would stop you from doing what you want to. What would stop you from doing what you want to, is if every time you got up, an invisible force kept holding you back. Now surely that would stop you from doing what you wanted to, wouldn’t it? Exactly how do you define perfect? Being fluent perhaps? But that’s your definition of perfect. Another person’s definition might be to get 100% marks in every exam. The point is no universal definition of ‘perfect’ exists. Otherwise we would all define ‘perfect’ as meaning the same thing. So go ahead, believe that by being fluent you will be perfect. Only please don’t expect many others to believe the same as you. If your statement ‘I get humiliated’ holds true then surely every part of your mind and body must be humiliated right? So which part of you gets humiliated? Is it your left arm? Or your big toe on your right foot? Or perhaps the toe on left foot is feeling bad? Does one toe get humiliated more than the other? How humiliated does that birthmark you have feel? Ask it to tell you a scale of 1 to 10 how strong the humiliation is. What’s the worst thing that will happen if you pick up the phone? You will stammer? OK, I can see how this works… And by stammering, what does this mean? It means the other person will become impatient? How do you know? Oh right, you don’t know? But you still think the person will become impatient? And by the person becoming impatient what does that mean? It means they might put the phone down? Alright! And by them putting the phone down, does your life automatically come to an end? It doesn’t? Are you sure? You are? Good. And remember the next time you sense a person is becoming impatient with you over the phone, he or she might be desperate to go to the toilet! As much as you like to believe your stammering is important, if someone was to choose either giving attention to this, or to a call of nature, both you and I know which will one win. From the 5 beliefs and the responses above, I hope you get the message I’m trying to convey. You may believe that your beliefs and views are the way things are, period. The truth is, there could be at least 10 different beliefs and views as well. 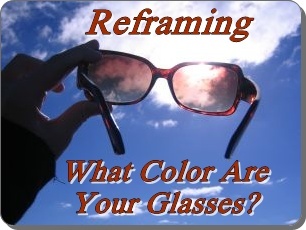 3 Responses to "Guest Post: Positive Reframing"
Great to see the great Hiten Vyas guest blog here! Golden, powerful stuff as per usual.